I’m a little excited about this outfit today. I may or may not have been planning it for over a month after Porch reached out to me to take part in their Pantone Style Challenge! You may remember Porch from when we started our condo remodel, which is still happening, by the way. Update soon! Anyways, of course, I said yes. I love a good challenge, and I’ve already been dying to start shopping for spring. This was just a great excuse to go on a mini shopping marathon. The only unfortunate thing? I didn’t pick a very timely color. I think green would have been a little more appropriate on St. Patrick’s Day, but instead I’m currently rocking some shamrock nails. Just a little green is good enough for me. The challenge that Porch set up was to style an outfit based on a room of our choice from their website. I picked the above room – it just spoke to me. It’s feminine, but the purple keeps it from feeling too young. I dig the pops of fuchsia and the deeper purple tones that were used to bring out the rug. What I really love though is the wallpaper – and so I tried to highlight each of those colors in my outfit. 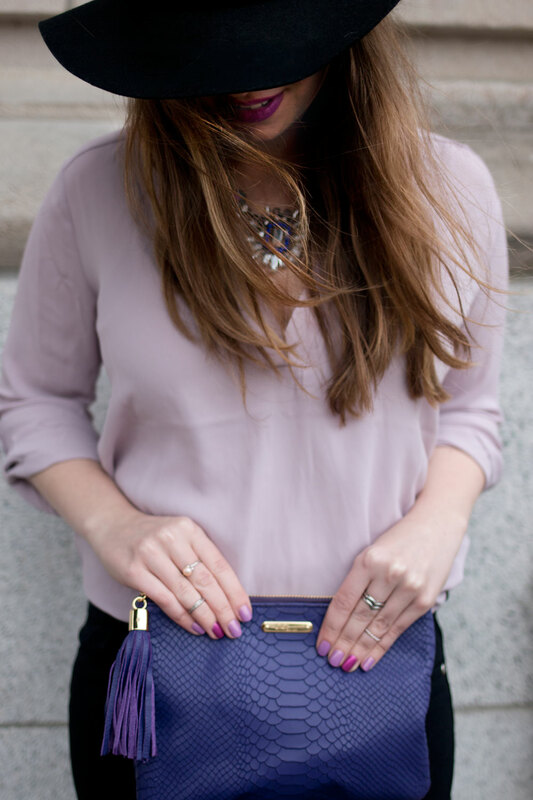 The flowy top in lilac was my main piece, then I added a pop of fuchsia with my accent nail and brought in the dark purple bag and necklace as accent pieces. I also wanted to bring in a couple of new trends for this spring I’m excited about. One is flare leg jeans – I was hesitant at first, but finding a cut of jean that fit properly in the thigh/knee and the correct length was critical. I feel like they make my legs look way longer! A fun trend that’s flattering? Count me in! I highly doubt I’ll be getting rid of all my skinny jeans anytime soon, but I’m excited to work these flare jeans into my wardrobe more often. I also love a good flowy blouse, and this lavender one was the perfect complement to the room I was emulating. While it’s not quite as dark as the rug in the room, I liked the lighter tone for spring. It’s almost a neutral this way and much more interesting than a white button up blouse. Additionally, I like adding accessories to my wardrobe in the spring – I feel like it’s an easy and inexpensive way to bring in the bright, pastels without looking too young or childish. *Disclosure: Porch provided me a gift card to put towards purple-colored items for the Porch/Pantone style challenge. Items were selected by me, and no further compensation was received. As always, opinions are my own. What color(s) are you most excited to wear this spring? How will you be incorporating them into your wardrobe? So cute! Absolutely love that hat. This is such a cool challenge! Love this outfit! Those pants totally make your legs look long and they are so flattering! I love spring colors because they are often muted and soft, but still add that hope of color! At the end of our 8 week health challenge, I’m going to go shopping to celebrate losing some weight and hope to add some cool pastels and light greens and blues to my wardrobe! Thank you Chelsie! That sounds like the perfect plan – I can’t wait to start adding even more pretty colors to my wardrobe! I love this look! I applaud you for going for the flared pants! I haven’t owned any flare leg pants since middle school. And I’m hesitant to buy some because my legs are already so long that they don’t need to look any longer! haha but seriously, this outfit is great! Haha, I haven’t had any since high school! I loved them back then though, so it only makes sense that I’d be okay with them again. Jealous you already have the long legs though! Thanks Samantha! They definitely make your legs look long! I love this outfit. I have yet to be brave enough to try the “tucked in shirt.” But it looks great on you! How you’re wearing it here is a new way I hadn’t really thought of, but I’m really digging it! I love this outfit! Those jeans definitely make you look taller, and all the pops of purple are so spring-y. I’m really ready for fresh spring colors after this long winter! You are killing it with these Porch posts :) I really like your hat! Hope I can find it at my local Forever 21. Thanks Lauren! I hope so – this style seems to keep going out of stock and disappearing from their website! I love that clutch! It really pops! You look so gorgeous! What a great color for you! I LOVE the outfit you put together! It looks fantastic and wears well! Love your oufit!! the blog is lovely! I did a similar post on pantone spring color report..its in popular post section of my blog. Found you on group “grow your blog” Love making new blogging friends! I absolutely love your outfit! And what a cool challenge – you nailed it! Love the flare jeans by the way, I’m pretty excited that they’re coming back! You’re an inspiration, I think I could totally pull off this look! I LOVE that blouse on you! The color is gorgeous! I really love those wide-leg trousers, such a flattering shape. I love the room you picked to represent your outfit. I love the pink colors and your blouse is beautiful. What a fun idea! Love the outfit! The flares are so on trend! I loved this! Your outfit reminds me of berries. IDK, it just does! Hahaha! Thanks for being a part of the #Porchstylechallenge! I love the outfit you made out of the inspiration! Those pants are awesome. Im not sure I could pull them off but they are awesome! What a fun challenge! I love the room you picked and the eventual color scheme. It’s no wonder I’m in love with the final look either! It’s very 70s chic and falling in line with current trends too. I think the flares look great on you! Thanks Kati! I thought so too. :) Definitely was going for the 70s vibe, with a fun pop of color for spring! I like the top and clutch together. Thanks for linking up at Who’s Wearing What Wednesdays at Pastries, Pumps and Pi! Thanks so much Taylor! I’ll check out your link up! You look amazing! I’m obsessed with that pretty clutch!! Aw, thanks so much Courtney! What a gorgeous outfit, I really love that lavender blouse, it’s perfect for spring.